The Paris Motor Show was stuffed so full of dazzling concept and production cars we had to split our photo round-up into separate galleries showcasing French design, adventure vehicles and general highlights. At such a show, it would have been quite easy to overlook a a plain white Kia Optima tucked away in a far corner. However, that low-key car was the base of one of the more interesting technological concepts in Paris: a 48-volt hybrid with electric supercharging. 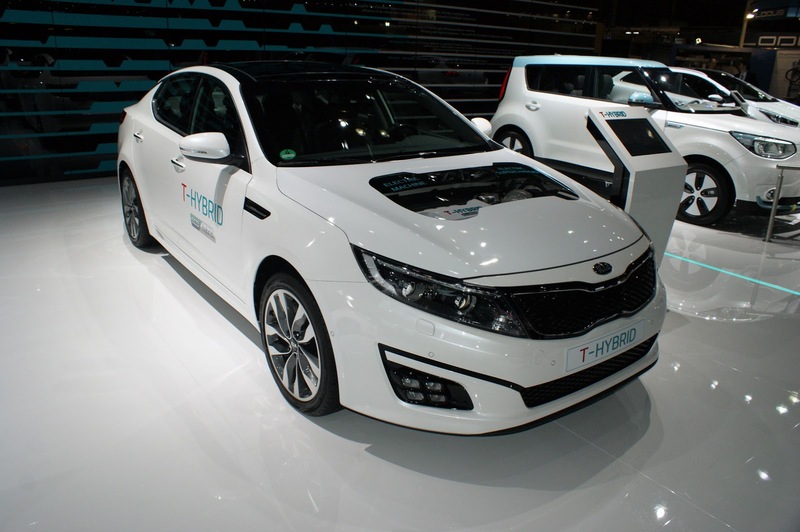 The Optima T-Hybrid concept previews Kia's new mild hybrid powertrain technology ahead of future mass production. The 168-hp (125 kW) FWD powertrain combines a 1.7-liter CRDi turbo diesel inline four-cylinder with a small electric motor offering light zero-emissions driving capabilities. The motor is powered by a 48-volt battery, and Kia says the lead-carbon battery offers advantages over more common lithium-ion in that it does not require active cooling and is easier to recycle at the end of its lifecycle. The hybrid layout also includes a zero emissions start-stop system with a belt-driven starter generator that allows the engine to restart with little noise or vibration. Similar to what we've seen in Audi's labs, the T-Hybrid car has an electric supercharger that works with the conventional turbocharger to deliver improved torque and power numbers across the engine speed spectrum, helping particularly with torque and response at low engine speeds. Kia is still developing the powertrain and says that it has not yet fully vetted its performance and fuel economy figures, but believes that the diesel-electric mild hybrid setup can boost power by 15 to 20 percent while dropping CO2 emissions below 100 g/km and raising fuel economy to 56 mpg (4.2 L/100 km). This is compared to 128 g/km and 48 mpg (4.9 L/100km) in an Optima with the 1.7-liter turbo diesel engine and Idle Stop & Go start/stop feature. Kia also believes the hybrid powertrain can cut more than a second off the 1.7-liter Optima's 0-62 mph (100 km/h) time, bringing it down to 9 seconds. "In [the] future, our mild hybrid powertrain could offer Kia customers greater performance and lower running costs, without sacrificing the qualities they expect of a Kia car – enjoyable handling, a comfortable ride and high quality," says Michael Cole, Kia Motors Europe COO. "Demonstrated for the first time in the Optima T-Hybrid, the technology will lower the total cost of ownership of our cars, yet still keep them affordable as an outright purchase for customers." Kia is still developing the T-Hybrid powertrain but seems committed to bringing it to production. It says that it will consider the T-Hybrid for future models, not necessarily limited to or including the Optima.